"DKMX" by Clemence Seilles The DKMX cafe chair revisits the Danish 1980s chair by Pelikan. Rather than the smooth tubular structure of the original chair, it's a lighter line and a harsher one too, which reveals details inspired from Mexican forgery. DKMX comes in three combinations: night blue/pink, night blue/caoba wood, and white/caoba. 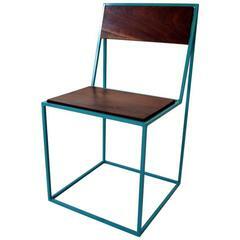 Designer: Clemence Seilles Materials: Caoba wood, metal, rope Dimensions: 70.5 x 49.5 x 47 cm Weight: 6.920 kg. STROMBOLI.ASSOCIATES is a contemporary design label and studio based in Mexico City. STROMBOLI.ASSOCIATES aims to provide objects and furniture that are unique, unexpected, and excite one’s imagination. Our discerning customer is looking for a genuine and original design that stands out from what is available on the market place, yet at an affordable price. Besides every-year’s collection, the label releases as well independent production in collaboration with invited artists and designers : sculptural objects, rare designs, gesture and research in workshops that reflects label’s commitment to experimental approach and prospective discourse. STROMBOLI.ASSOCIATES has already collaborated with Italian eyewear brand OXYDO, fashion label Andrea Crews, designers Elisa Valenzuela, Fabien Cappello and Travis Broussard, and artists Theo Demans and Melanie Bonajo. STROMBOLI.ASSOCIATES commits to originality and excellence by carefully choosing its collaborators. For each design piece, our studio explores a relationship between industrial resources and manual handling of craft techniques. Through its intimate relation with local producers in Mexico, STROMBOLI.ASSOCIATES ensures both the quality and the sustainability of its production. We work with interior designers and furniture resellers all around the world. We also work on bespoke interior projects in hand with architects studios for exclusive designs. Lovely vintage set of three French cafe chairs. Measures: 90 cm high, 40 cm wide, 39 cm deep and 47 cm seat height.